Noah's Ark Crib Quilt Top will delight everyone. 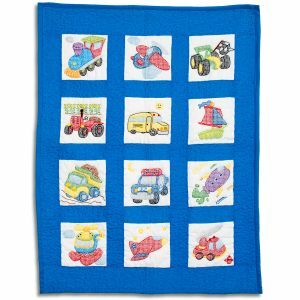 The baby quilt embroidery kit contains the design stamped on the material, detailed embroidery instructions, assembly guide and and a DMC floss list. This was the first quilt top I ever made. It was easy and fun as I was making this for my first Grandchild. I hand quilted it (I watched youtube videos) and it turned out beautiful! It is big hit! just beautiful finished! my 5th Noah’s Ark, just love it and so easy to do. My mother just completed the embroidery and I am now ready to quilt, but did not have quilt pattern printed. How did you quilt? Not sure about the embroidery especially in middle. This is beautiful finished. I worked on it for about 3 months. It’s challenging, but well worth it!